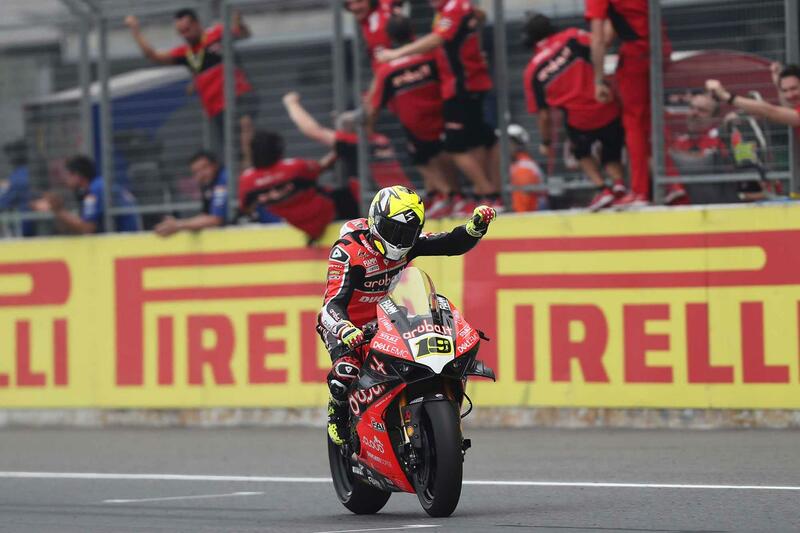 World Superbike rookie Alvaro Bautista has taken his fourth successive victory in the first race of the weekend at Buriram in Thailand ahead of Jonathan Rea. The Ducati Panigale V4R rider crossed the line over eight seconds in front of the four-time champion, despite the pair making contact in the early stages of the race, which pushed him back to third place. They collided at turn three with 18 laps to go, in a racing incident that allowed third placed Alex Lowes move ahead of the Spanish rider for second. From there, Bautista mounted an assault on the riders in front of him, passing the Pata Yamaha of Lowes for second, before exchanging a series of record-breaking lap times with Rea. He was eventually able to pass the Kawasaki rider for the lead before turn two, using the drive of the Ducati to muscle his way past. From there, he was able to gap the field, finishing 8.217 seconds clear of Rea. Crossing the line 14.155 seconds down on the race winner was Lowes, who was able to keep a gaggle of riders behind him for the final spot on the podium. The Brit rider was locked in a race-long battle with teammate Michael van der Mark, Leon Haslam and GRT Yamaha’s Marco Melandri, with Haslam and Melandri making contact on the start/finish straight in an attempt to climb positions. Bautista’s teammate Chaz Davies crashed out of the race at turn three, before remounting to take 15th position and one championship point. 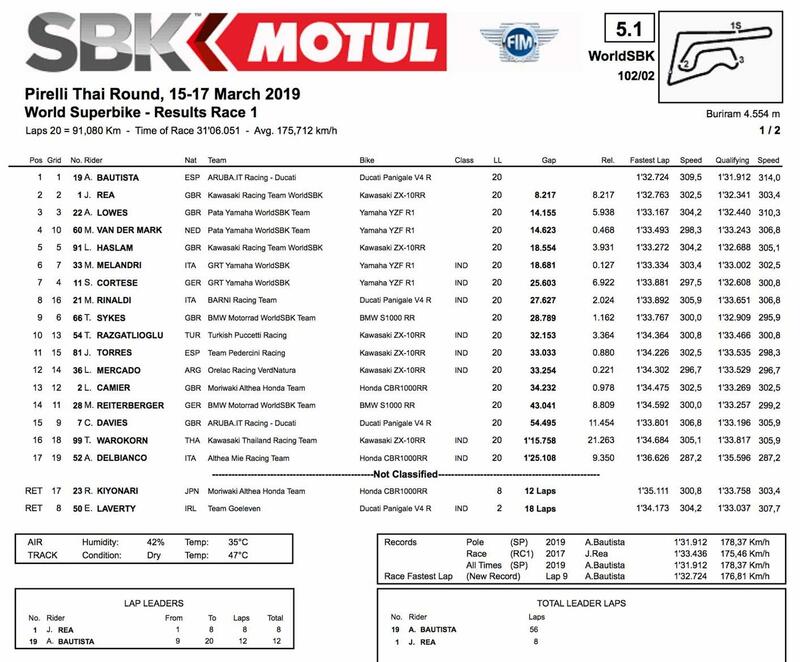 Other fallers also included the Team Goeleven Ducati Panigale V4R of Eugene Laverty, with the Northern Irish rider appearing to jump off the bike on the final corner with 18 laps to go, in what looked like a brake-related issue. Ryuichi Kiyonari also fell from his Moriwaki Althea Honda CBR1000RR Fireblade with 12 laps left to run.